Two classics from The Pioneers – back to back on a single CD! 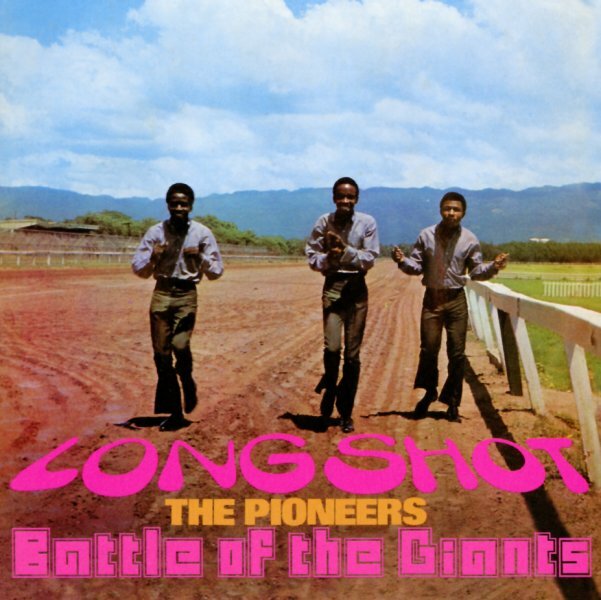 First up is Long Shot – an early gem from The Pioneers, and one of the first records on the Trojan label too – the kind of head-nodding, late rocksteady sounds that made the imprint a key bridge between the scenes in Kingston and London at the end of the 60s! The Pioneers have a bit more complex vocal interplay than other Jamaican vocal groups of the time – an ability to harmonize together, but break out a bit too – trading lines with increasing complexity that reflects the growing expressiveness that would flower more strongly in roots music during the 70s – turned here towards themes that are a bit less global, but even more charming in that respect. There's a wonderfully unified feel to the whole album – and titles include "Caranapo", "Long Shot Kick De Bucket", "Black Bud", "Lucky Side", "Samfie Man", "Mother Ritty", "Bring Him Come", and "Boss Festival". Battle Of The Giants is a great set, with heavy Leslie Kong production – and titles that include "Money Day", "Consider Me", "Driven Back", "Gorgeous & Marvelous", "Now You Are Gone", "Cherie Cherie", "Simmer Down Quashie", and "Mally Mally". CD also adds in 7 more bonus tracks – including "Mettle", "Just Enough", "Cha La La I Need You", "Easy Come Easy Go (rocksteady version)", and "Get Ready". © 1996-2019, Dusty Groove, Inc.